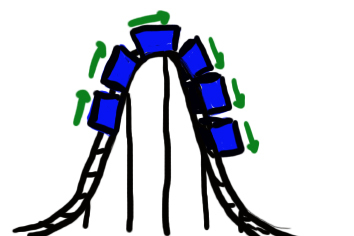 In my last post about rollercoaster physics, I talked about what happens when a rollercoaster goes round banked and flat corners. This time, I’m going to take a look at what happens when the coaster train goes down drops and over hills – basically, every time your stomach gets left behind on a coaster! The first drop on the El Toro rollercoaster, which reaches a massive 76 degree slope. 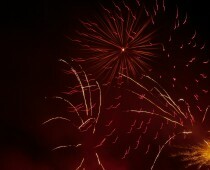 Image: Dusso Janladde. 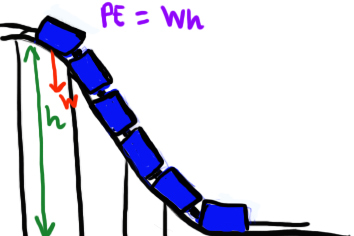 At the top of a rollercoaster drop, the car - and the people inside it - have potential energy (PE). The potential energy here is basically the energy stored at the top of the drop: the energy you potentially could gain. So, for example, on a skydive your potential energy at the top is the same as the kinetic energy (energy from the movement of you falling) at the bottom, because that’s the maximum energy you can gain from gravity. In this case, the maximum energy that the car and its passengers can gain is restricted by the height of the drop: they can only drop a certain distance, so their maximum speed (and maximum energy) is restricted. At the bottom, the kinetic energy (KE) is the energy that the rollercoasters have from speeding away. which only works if we know the speed. However, through the law of conservation of energy, we know that energy can’t be created or destroyed: so the energy at the top has to be the same as at the bottom. In other words, the potential energy at the top and the kinetic energy at the bottom are the same. Perhaps that’s not surprising, given that the potential energy is the maximum energy the rollercoaster can have at the bottom of the drop! The cars are held onto the track, so their directions of travel are restricted. The passengers in a rollercoaster at the top of the hill keep on going up at the top before being pulled back down again. It’s that bit at the top – where the passengers fly off before being pulled back by the harness – which gives that weightless, ‘air time’ experience that can often leave stomachs at the top. I would suggest that you think about this next time you’re on a rollercoaster, and see if you can notice that air time experience occurring on the hills – but I also know from experience that it’s pretty much impossible to think about anything on a coaster, so I’ll just leave you to think about it!